Every year, new species of animals are being discovered by scientists. 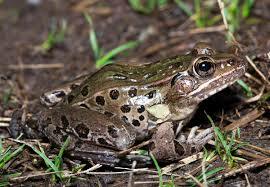 One of the most amazing discoveries this year was the Atlantic Coast leopard frog. These lovely little frogs are only about 10 cm (4 inches) long. Although they were only identified as a separate species in 2014, a scientist named Carl Kauffeld first raised the theory of a new leopard frog species back in 1936. The Atlantic Coast leopard frog was given the scientific name Rana Kauffeldi in his honour. They are very similar to 2 other species of leopard frogs that live in the same area, but they can be told apart by their different call that sounds more like a cough than a croak. It was this unique call that encouraged Jeremy Feinberg to investigate further, resulting in a new species being identified. Their skin is able to change colour, going from a light green during the day to a much darker green at night time. As their name suggests, these guys are found on the Atlantic Coast of the United States. It’s amazing that they weren’t identified for such a long period of time despite being found in very large cities such as New York. Are there any other interesting facts that you would like to share about Atlantic Coast leopard frogs?